The Nestle Resource 2.0 Delicious Complete Vanilla Creme 32oz BrikPak Each, Model #27600000, is anchored in advanced science and research. Nestle Healthcare Nutrition offers nutritional solutions for people with specific dietary needs related to illness, disease states or the special challenges of different life stages. 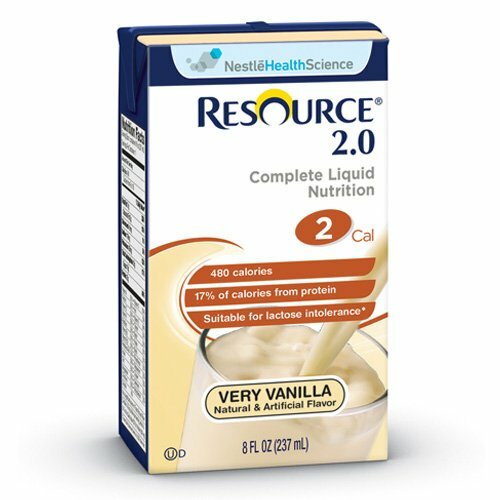 The Nestle Resource 2.0 Delicious Complete Vanilla Creme 32oz BrikPak Each is ideal to help meet increased protein or calorie requirements. With 480 calories and 20 grams of protein per 8 fl oz serving, this calorie and protein-dense nutritional drink is ideal to help meet increased protein or calorie requirements. Appropriate for medication pass supplement programs. Calorically and protein-dense oral drink containing 2.0 kcal/mL and 20g of protein. Ingredients: Water, Corn Syrup, Canola Oil (with BHA/BHT To Preserve Freshness), Calcium Caseinate (Milk), Sugar, Sodium Caseinate, Natural and Artificial Flavor, Potassium Citrate, Distilled Monoglycerides, Cellulose Gel, Maltodextrin, Potassium Phosphate Dibasic, Sodium Ascorbate, Magnesium Chloride, Choline Chloride, Soy Lecithin, Sodium Citrate, Magnesium Oxide, Cellulose Gum, Calcium Phosphate Tribasic, Alpha Tocopheryl Acetate (Vitamin E), Ferrous Sulfate, Zinc Sulfate, Niacinamide, Calcium Pantothenate, Copper Gluconate, Manganese Sulfate, Vitamin A Palmitate, Pyridoxine Hydrochloride, Thiamine Hydrochloride, Riboflavin, Chromium Chloride, Folic Acid, Biotin, Potassium Iodide, Sodium Molybdate, Sodium Selenite, Phytonadione (Vitamin K1), Cholecalciferol (Vitamin D3), Cyanocobalamin (Vitamin B12).